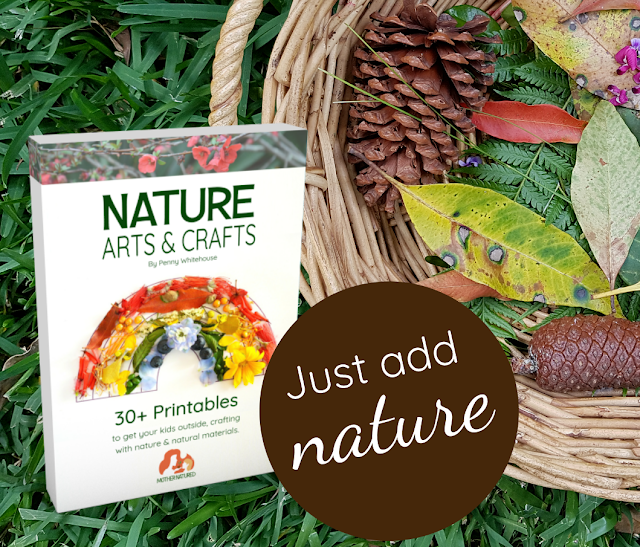 Harness the Power of Nature this Fall! What is not to love about fall? Crispy colored leaves on the ground, acorns, caterpillars, apples, pleasant weather...I could go on and on! It's the perfect time to get your children or students learning in nature. Nature is a powerful teaching tool. 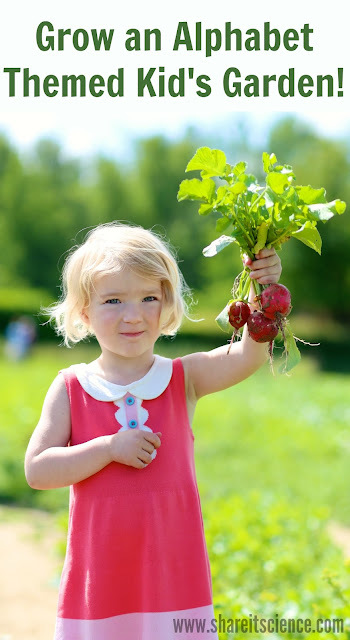 It inspires kids to ask new questions, explore things they have not seen before and spending time outside has been shown to benefit kids overall health and learning. I've pulled together a bunch of resources to help you teach your students outside this fall. 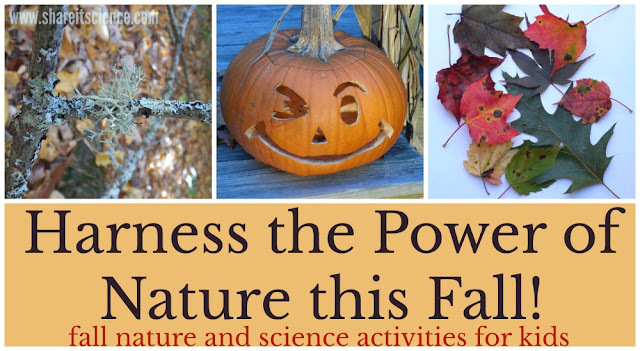 From pumpkins and apples to leaves and twigs, scavenger hunts to garden harvests, you'll find all the ideas you need to provide a nature-rich learning experience for your classroom or homeschool. This post contains affiliate links, meaning I make a small commission (at no additional cost to you) from purchases made from these links. Please see disclosures for more information. Search for Lichen- its everywhere once you start to look! Look Up! Find a nest you didn't know was there! Take advantage of those fall colors and the abundance of leaves that have dropped to the ground to create some great nature art. In choosing natural supplies for art pieces, students really take a closer look at these items than they might otherwise. 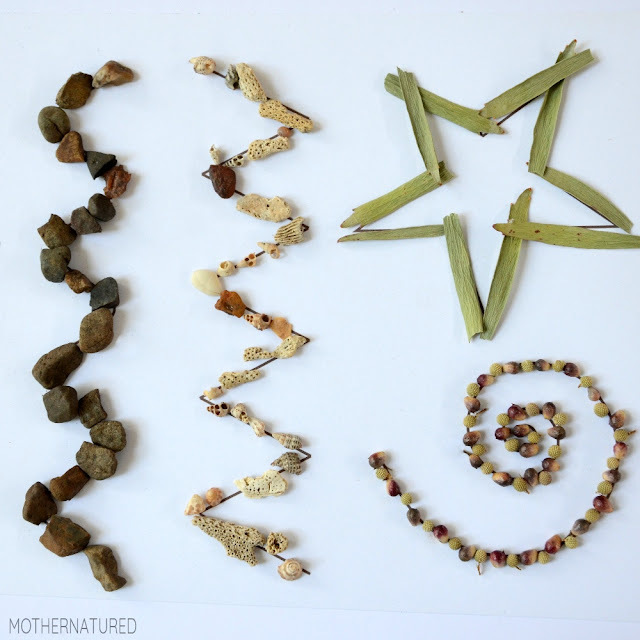 A great way to guide these projects is with this nature printables pack. You can see how we've used our copy here. It is awesome not only for creating beautiful art pieces, but also mastering early math skills like symmetry and patterning. Woolly bear caterpillars have amazing adaptations to winter! Learn about woolly bear caterpillars here. Monarch butterflies are incredible migrators. Here are some Monarch migration lesson ideas for Pre-K through High School. Some birds begin their fantastic migratory journey this time of year too. Find out how you can study bird migration here. Learn more about spiders with these spider STEM activities. Leaves are in abundance on the ground and changing colors on the trees. 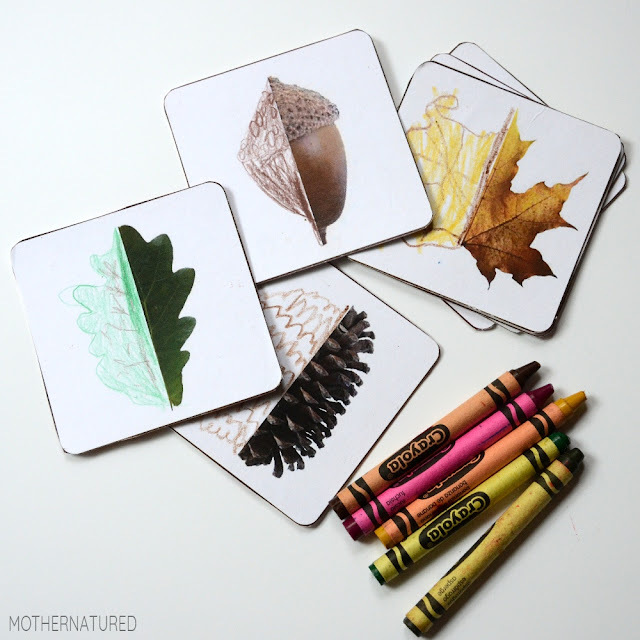 Try these activities with fall leaves. Why do leaves change color? 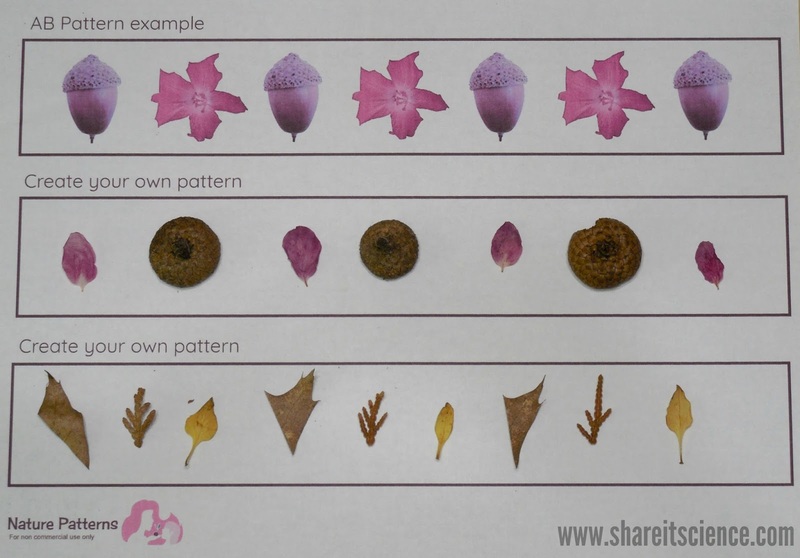 Try this leaf color science experiment. Do you wish you could save those beautiful fall leaves? Check out how you can by making a leaf journal. Science with Pumpkins and Apples! Experiment with some of nature's bounty this fall. Here are three easy inquiry science lessons that use pumpkins and apples! Can you prevent an apple from rotting? 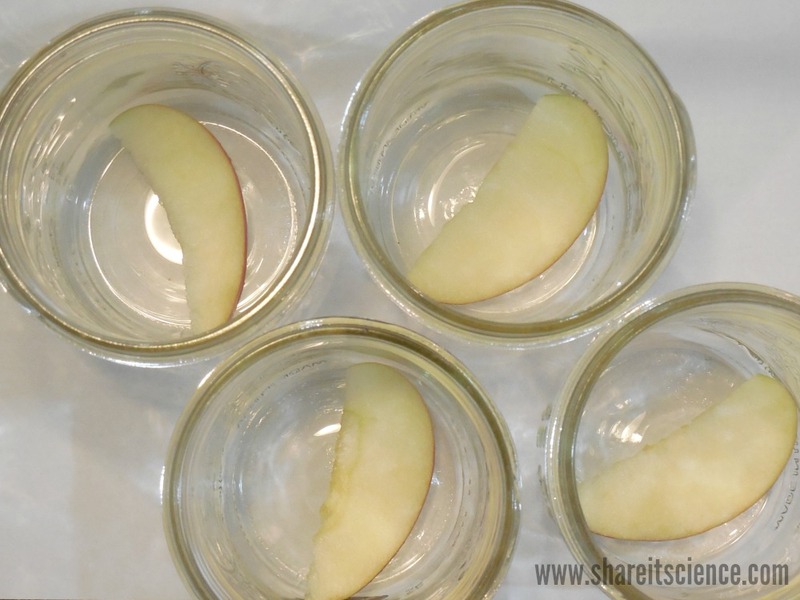 Try this easy, open-ended apple science experiment. Discover a pumpkin in a new way this year! Counting, measuring, life cycles and more in this pumpkin STEM investigation. Don't throw out that jack-o-lantern! Investigate decomposition with Pumpkin Jack! Kids love gross science. Sometimes things are so gross they are cool! So of course, they will be on board when you try this science experiment. 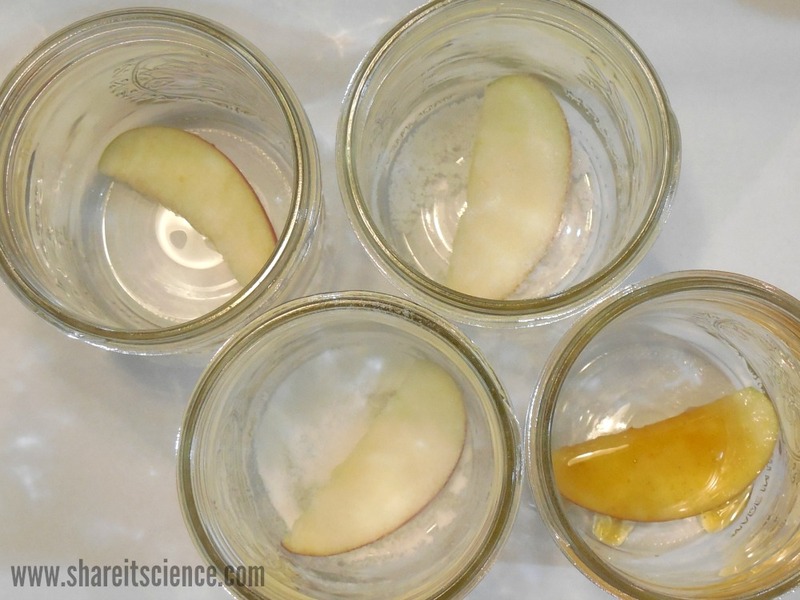 Challenge kids to see if they can keep an apple from rotting using preservatives. They will design and carry out their own science experiment. This is a great activity for school or home. Before you dive into the science, I'd highly suggest reading the super fun book, Zoey and Sassafras: Monsters and Mold. In this second book of the Zoey and Sassafras series, science-minded Zoey must systematically experiment to find what will help a monster with an embarrassing mold problem. 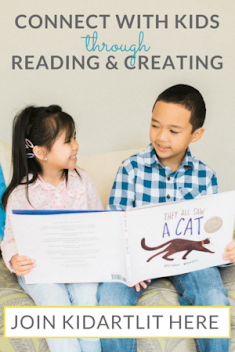 This illustrated chapter book, is geared for readers in Kindergarten through 4th grade, and also makes for an excellent read-aloud to kids of all ages. The book series by Asia Citro features a curious girl named Zoey who loves science and animals. She is a strong, relatable character and will resonate with any kid who loves finding the answer to a question, even if it means getting a little dirty. The stories also include a bit of fantasy, adding to their appeal. Just like when Zoey had to test different things to see what would keep the mold from growing on monster fur, kids will investigate what preservatives might keep an apple slice from rotting. Clean recycled glass jars, beakers or canning jars (kids might also use zipper style baggies, but I like using something that can be washed and reused easily! 2. Set up one slice in a jar as is. This will be the control for the experiment. 3. 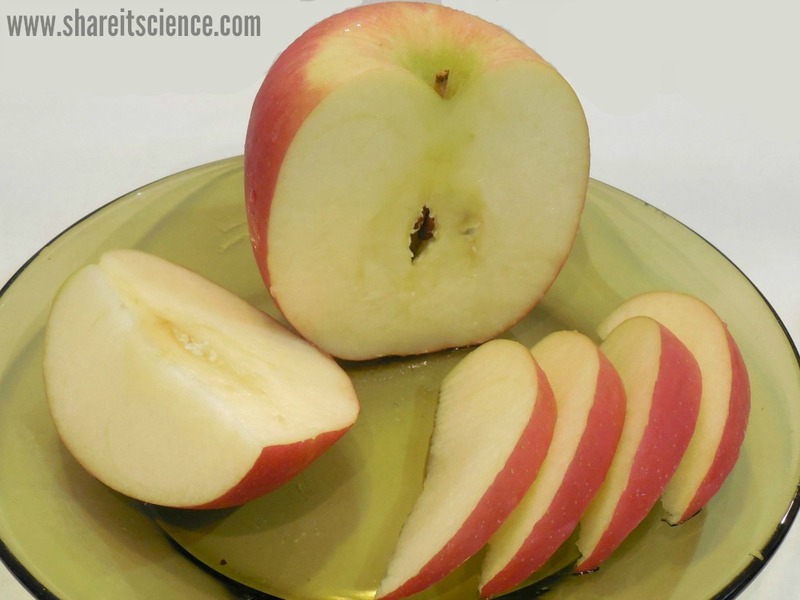 Determine how much "preservative" you will use on each slice of apple. In our experiment we decided to use 1 tsp each of salt, fruit fresh and honey. You could use just about anything, but this is a good opportunity to teach about being consistent with your measurements. 4. Set up as many apple slices in jars as "preservative" you want to test. For example, if you are testing salt, sugar, honey and vinegar you will need 5 jars; 4 for the apples with preservatives, one for the control. 5. Sprinkle or pour your preservative on the apple slices, trying to cover both sides. 6. 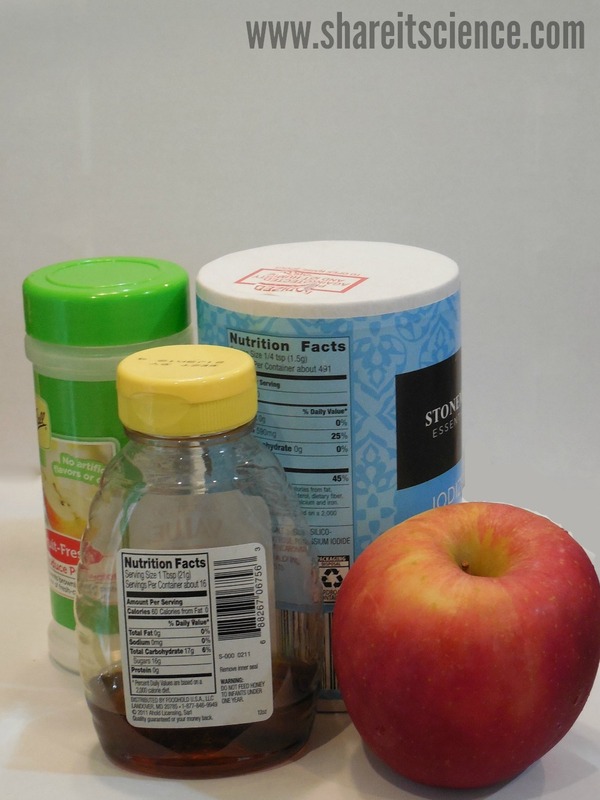 To keep fruit flies under control, you'll probably want to cover your experiment, either by placing the lid back on the jar, or plastic wrap on top. Remember that sealing up the jar will also help preserve the apple slices, so take this into consideration when you are discussing with kids. Then, make some observations and wait! This is what I would have called a "patience experiment" when I was teaching elementary science. Decide how often to observe- every day? Every 3 days? A week? and then stick to that plan. We're not going to leave our results here, we want you to try this one yourself! You can use this free printable Zoey and Sassafras science journal to keep track of the experiment. What variables may have affected what happened? Were they things we could control for? Why is it important to set up a "control" in an experiment? How is our experiment different from how decomposition occurs in nature? How is it the same? We want to hear about the results of your experiment! Leave a comment below or tag us (@shareitscience) in a social media post! Explore decomposition further with this Pumpkin Jack activity! If you are looking for another great activity involving decomposition, you might want to build your own worm compost bin for home or school by following these easy directions. 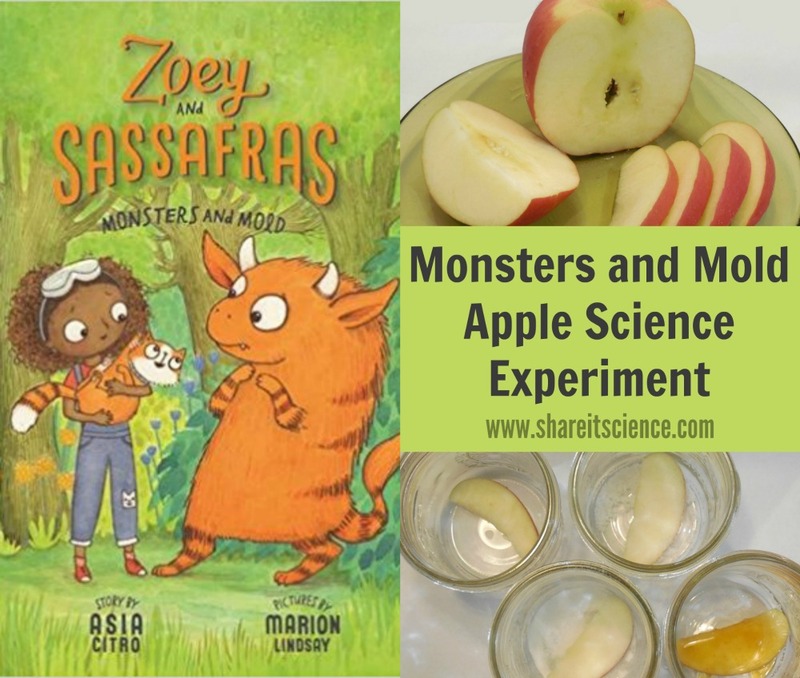 You will also definitely want to check out this Insect Investigation using the first Zoey and Sassafras book, Dragons and Marshmallows. You may not be aware of this, but when you purchase a book published by The Innovation Press, like Zoey and Sassafras: Monsters and Mold, you are not only getting a great book for the children in your life, but also helping others. For every 10 books sold, The Innovation Press donates one book to First Book, getting books into the hands of kids and schools in need. Disclaimer: I received a review copy of Zoey and Sassafras: Monsters and Mold in exchange for an honest review. Zoey and Sassafras character art is used with express written permission from Marion Lindsay and The Innovation Press. Just about everyone finds fireflies alluring and magical. 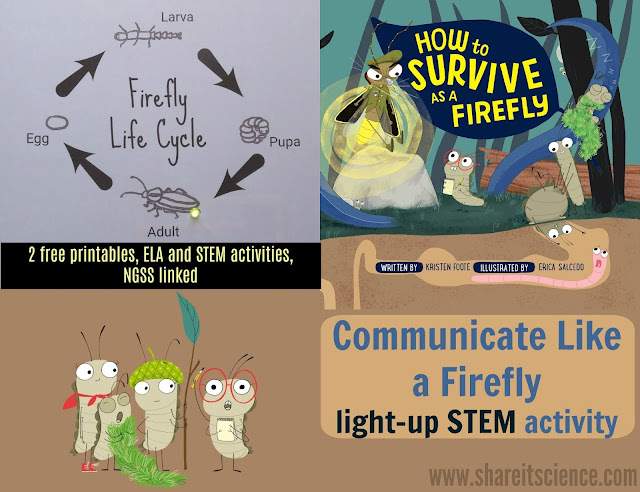 In this post I'm excited to not only share a fabulous, funny and scientific new children's book all about fireflies, but also a free language arts and science printable activity and a STEM activity that combines firefly communication, life cycles and electric circuits for some light-up fun! If you are a teacher or a parent, there is bound to be something in here that keeps your children or students engaged and gets them excited about fireflies. Read on to find out about all the activities listed above, including how you can align them with the Next Generation Science Standards (NGSS). 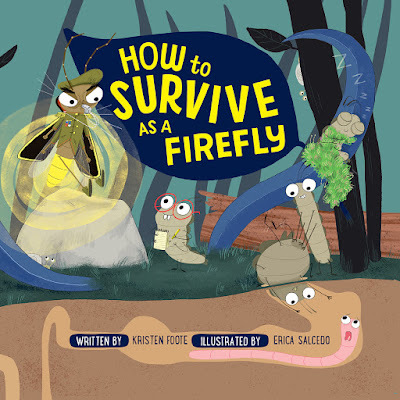 If you love kid's books that are not only fictional and funny, but also scientifically accurate, How to Survive as a Firefly by Kristen Foote, illustrated by Erica Salcedo, is definitely for you. 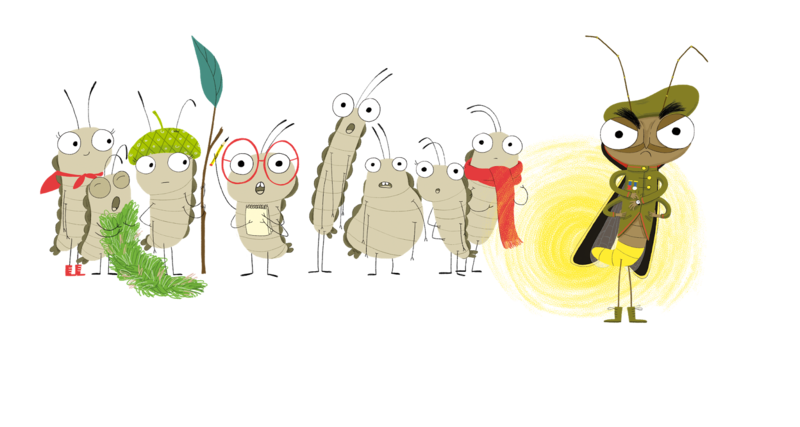 A group of eager firefly larva learn the ins and outs of their own life cycle from an adult firefly drill sargent. The humorous book outlines the life cycle of Photinus pyralis, the most common firefly in North America. Woven throughout the silly story are serious biology vocabulary words such as bioluminescence and aggressive mimicry. Despite the great number of syllables in these words they are made completely understandable in the text. Fun firefly facts are found on many pages as well. An upper elementary science class, or STEM loving kids at home will get a big kick out of this book. If How to Survive as a Firefly sounds good to you, you'll also want to read the other, equally enjoyable book in this series, How to Survive as a Shark. "Imagine you are an adult firefly who must describe the life cycle of fireflies to your nervous cousin who has just emerged from an egg." 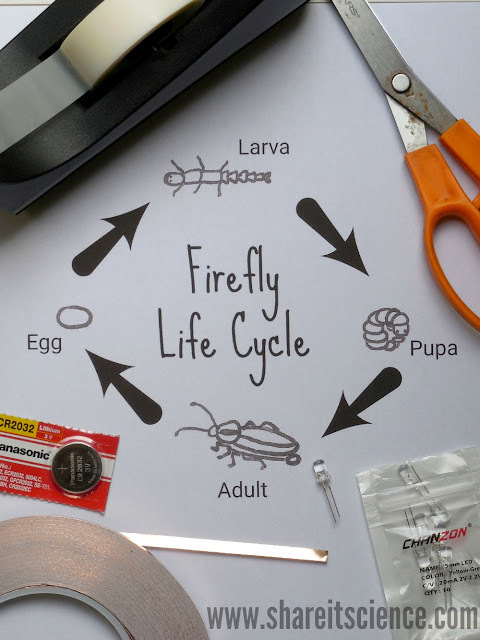 Use this free How to Survive as a Firefly-themed printable writing sheet and blank comic strip to write and illustrate the description of a firefly's life cycle. Adult fire flies, blink in various patterns with their bioluminescent abdomens (depending on species, temperature, etc.) to communicate with each other. This helps fireflies attract mates. Scientists study these patterns to learn more about fireflies. You can learn these patterns or make up your own firefly language too! Use this free printable life cycle sheet to start your light-up firefly project. **PLEASE NOTE: Lithium coin cell batteries can be harmful and even fatal if swallowed. Please take care that they are out of reach of small children. 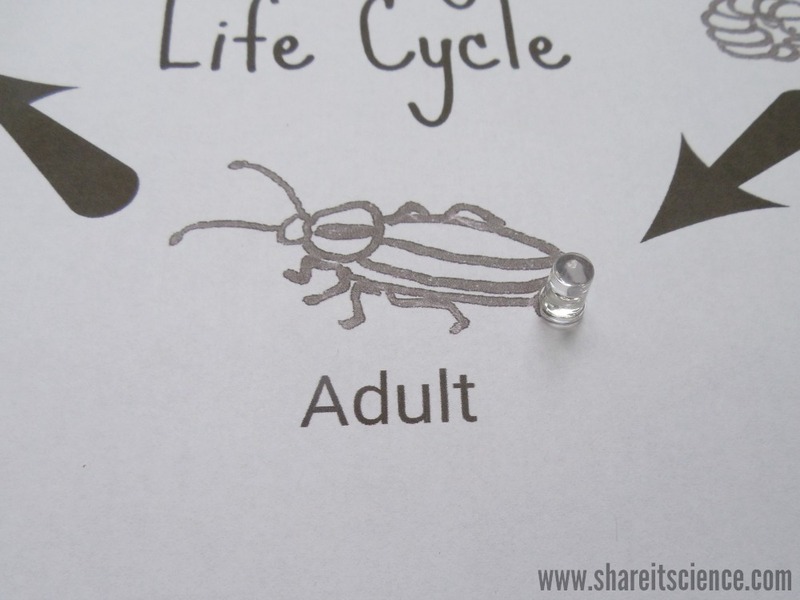 Poke a hole with the prongs of one LED light bulb through the life cycle sheet on the adult firefly's abdomen. Flip the paper over. 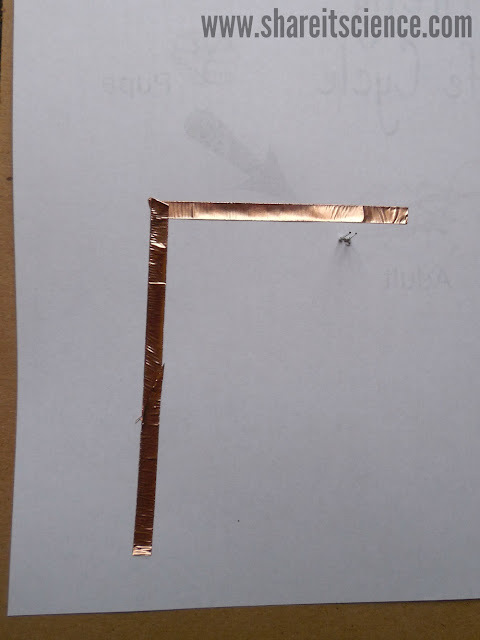 Peel off a piece of copper tape and add it horizontally just above the prongs of the LED (see image below). 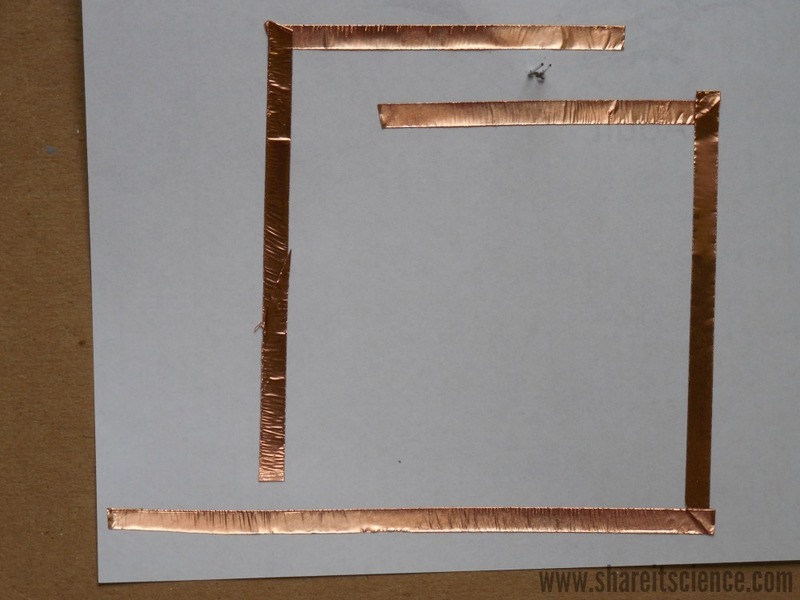 Make a sharp corner, either by folding (see tips here) or by using another piece of copper tape. The tape should stop about an inch above the bottom edge of the paper. 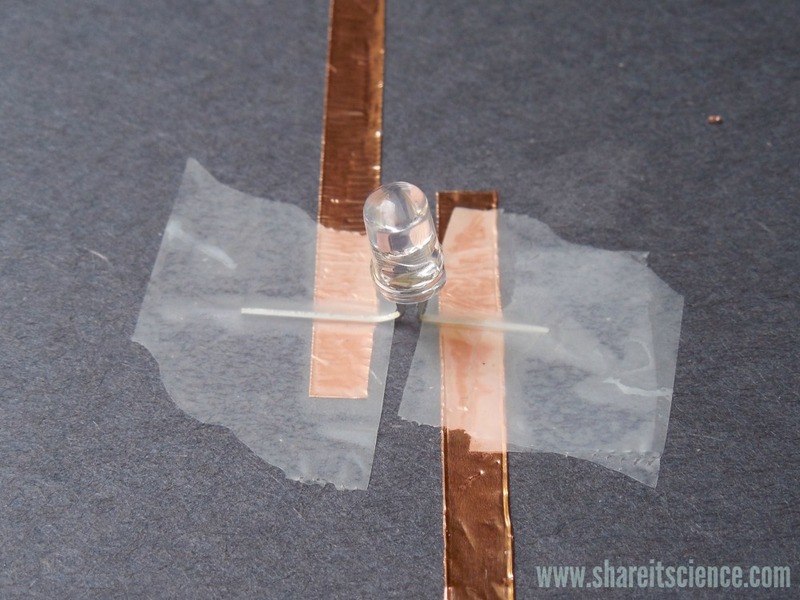 Add a longer piece of copper tape horizontally just under the prongs of the LED. Again, make a turn or add another piece vertically below it. Make another corner, or add another piece so that the copper tape follows along the bottom edge of the paper right to the horizontal edge. Be sure there is a gap between the bottom of the first copper tape strip and this one. 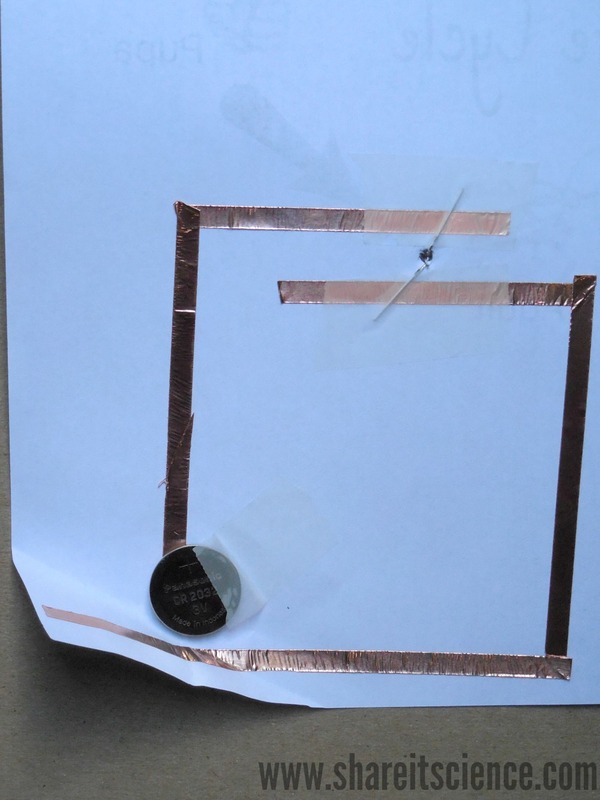 Test out your circuit before you tape anything down. 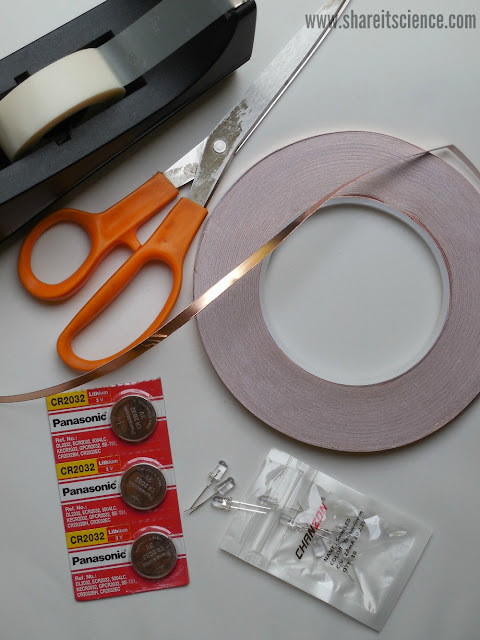 Fold the prongs of the LED down so that one is touching one strip of copper tape, and the other touching the second strip of copper tape. Place the coin cell battery on the bottom of the first strip of copper tape. You might need a second set of hands to help hold things down while you then fold up the bottom edge so that the copper tape makes a connection with the top of the battery. If the LED does not light, try adjusting where the copper tape is touching the battery. If it still will not light, rotate the light so that the prongs are making contact with the opposite strips of tape. The LED will only work in one direction. Once you've determined whether your battery and light bulb are in the correct position, and you've gotten it to light up, tape down the prongs of the LED and the battery. Be sure you aren't covering up the battery where it needs to make contact with the copper tape. 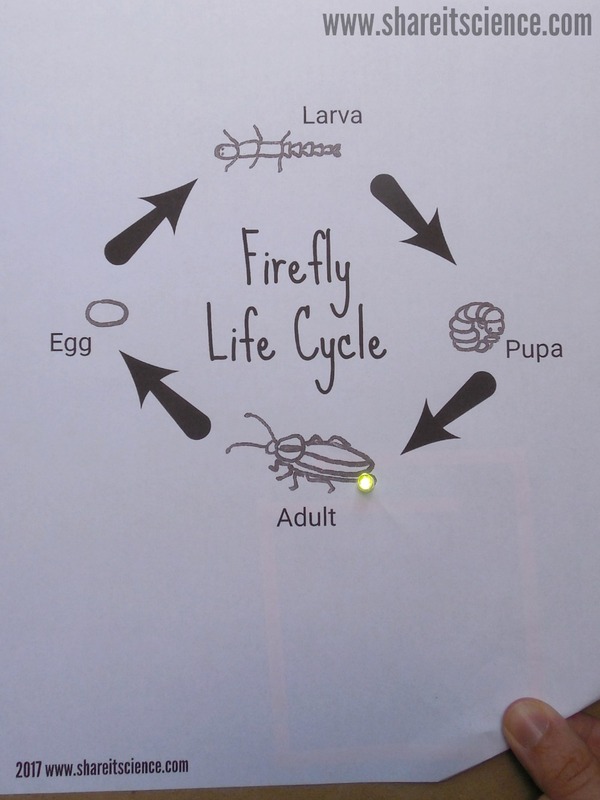 Now you can use your paper circuit firefly to blink and communicate with your classmates. 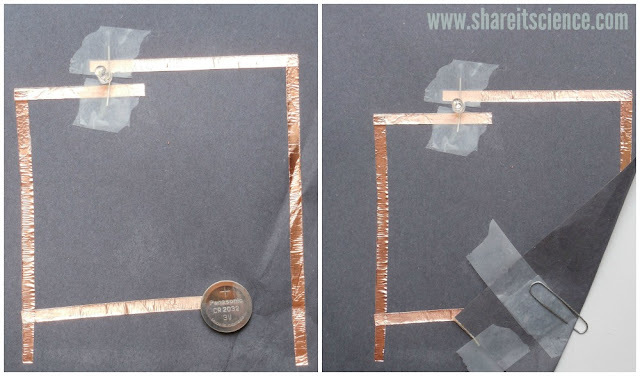 Close the circuit by pinching the paper around the battery. You can study actual firefly blinking patterns by visiting this firefly flash chart from the Museum of Science Firefly Watch project or learn more about their patterns with this Science Friday resource. These are a bit technical, but as long as kids understand that each species of firefly makes its own signal and pattern, then they can begin to create their own messages. If you enjoyed making a light-up paper circuit, you can use the same materials to create your own light-up board games! 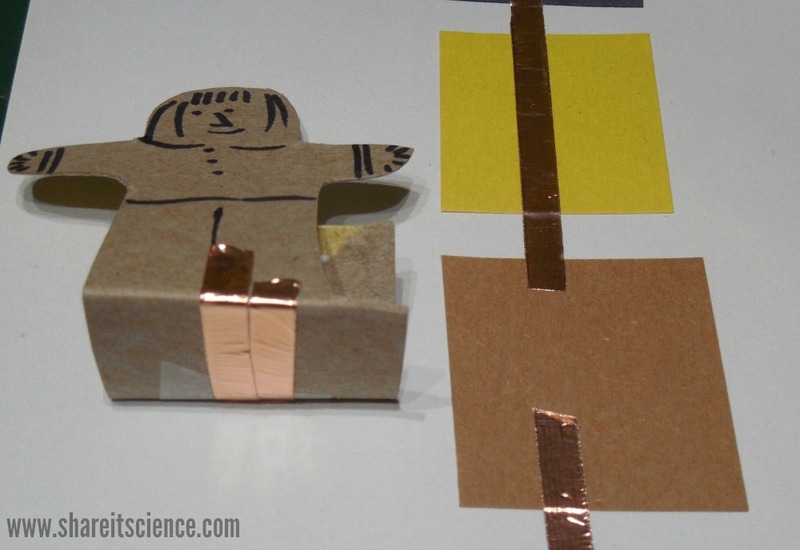 You can use this lesson to work toward meeting the NGSS. 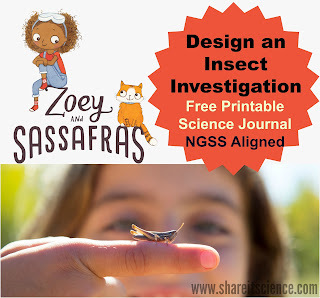 For another great book and NGSS linked science activity check out this Zoey and Sassafras Insect Investigation. You may not be aware of this, but when you purchase a book published by The Innovation Press, like How to Survive as a Firefly, you are not only getting a great book for the children in your life, but also helping others. For every 10 books sold, The Innovation Press donates one book to First Book, getting books into the hands of kids and schools in need. If you're looking for an activity that can keep kids engaged indoors for hours (literally) then you definitely want to try building your own light-up board games using paper circuits. 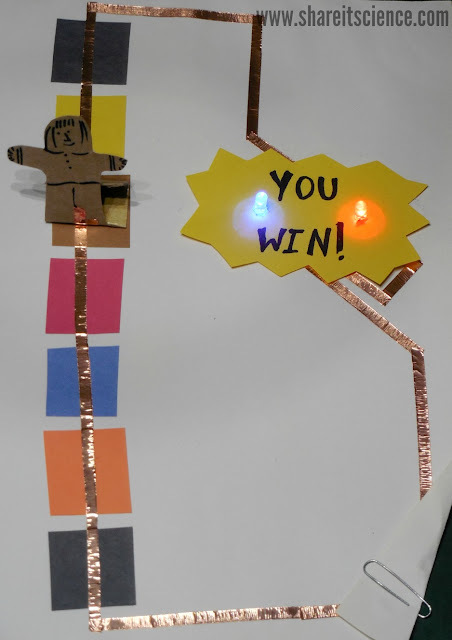 This is a great STEAM (science, technology, engineering, art and math) activity because through the process, your children or students will put their creative powers to use designing the game and board, learn the ins and outs of electric circuits, plus- design, test and tweak their light-up circuits like an engineer. 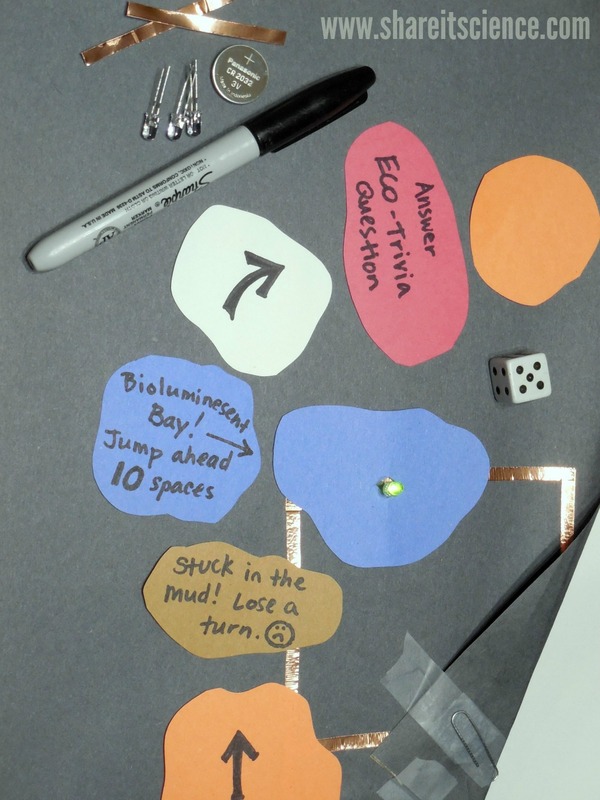 When I was teaching in the science classroom I used "design your own board games" every year with my 4th and 5th graders as a way to review at the end of the term. Kids love building games, and they worked hard to make the games challenging for their classmates, which meant they really reviewed the material accurately to do so. I always had to incorporate extra time into my plan for building the games and the culminating game tournament. **PLEASE NOTE: Lithium coin cell batteries can be harmful, even fatal, if swallowed. Please keep away from small children. It's a good idea to first map out what your game will be about, the objective and the basic idea behind how it will be played. How many people can play? What additional supplies might you need? A spinner or die? etc. Kids and students will also need to understand the general idea of an electrical circuit. They will learn a ton through trial and error figuring out how to build them, but giving some background is important. 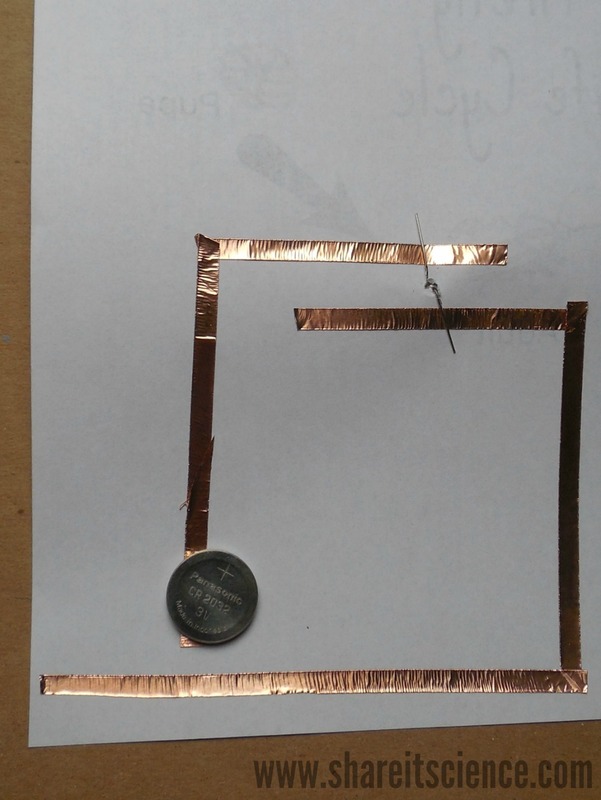 You'll find an engaging lesson to learn about circuits and conductivity here. The easiest way to connect the battery to the circuit is to fold the corner of the paper over the battery as we did in this example, however, I'm sure that there are many other creative solutions. Common hang-ups can be placing the prongs of the LED bulbs backwards (they only work in one direction) or not placing the copper tape in the right place to connect with the battery. 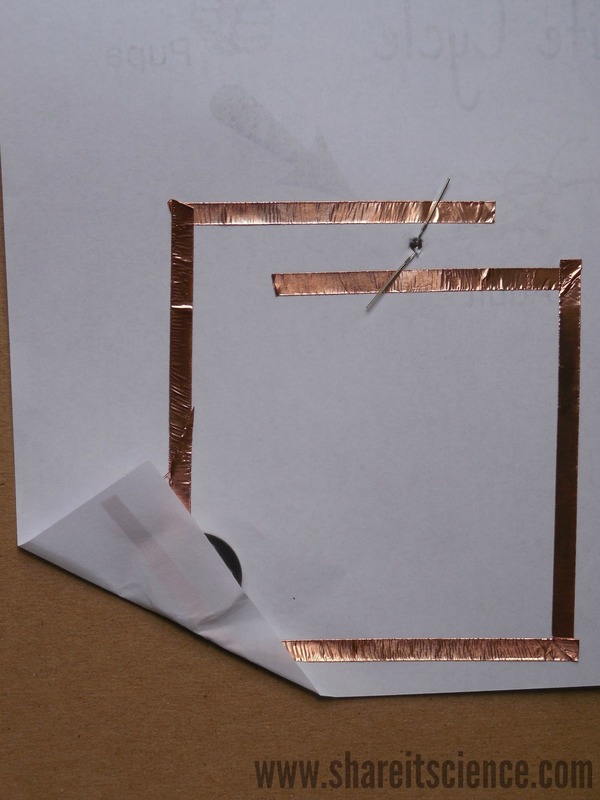 This is a great tutorial from the Exploratorium on paper circuits. There will definitely be some trial and error, and that is what makes this an excellent STEM learning activity. Have kids start out with simple circuits, one bulb only. This way there are only so many things to test and switch if it doesn't work right away. Then once they become experts, they might want to try multiple bulbs (each bulb will need its own battery), or making a "switch" to turn on the lights. We connected the circuit with the game piece by placing a gap in the circuit on the game board and sticking copper tape on the bottom of the game piece. The possibilities are endless once you get the hang of what you are doing. 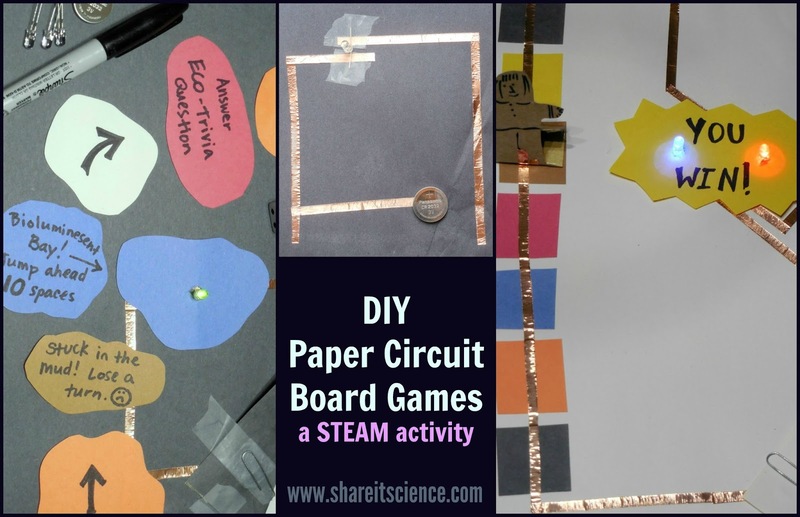 Here is another great resource for help with paper circuits. 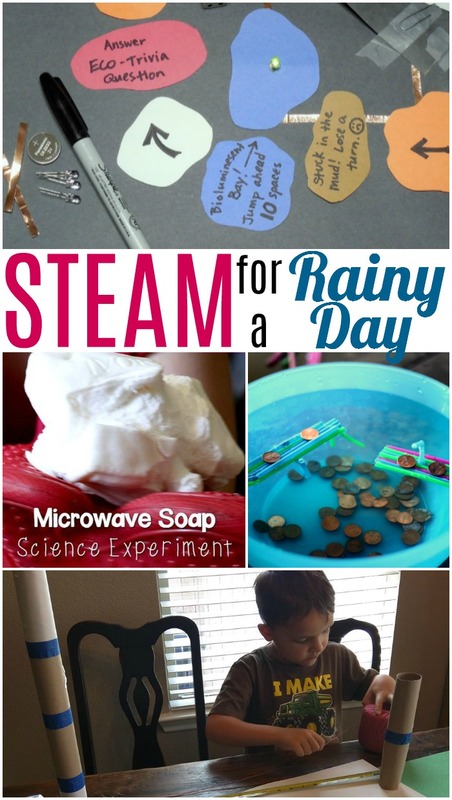 Check out these other great STEAM activity ideas for keeping your kids or students busy indoors!